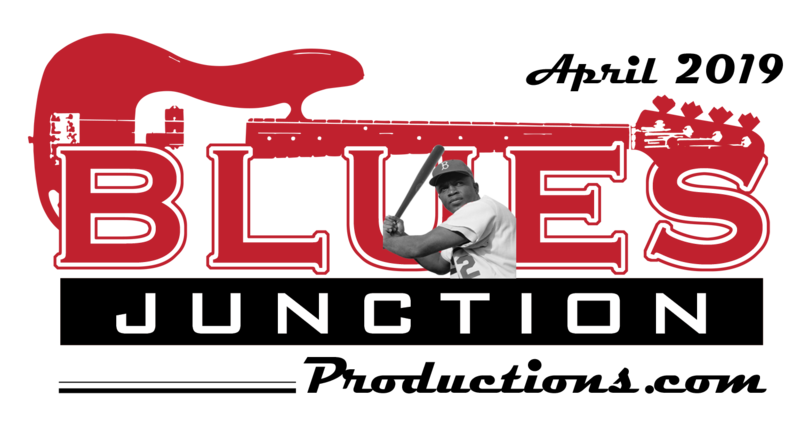 Southern California’s palm trees, sandy beaches and mild climate don’t make for good blues imagery. Swimming pools, movie stars and relocated hillbillies don’t either for that matter. Los Angeles however has a rich blues legacy that is second to none. That legacy has been pushed off the pages of the blues history books to make room for white people’s perception of what they think blues should be. 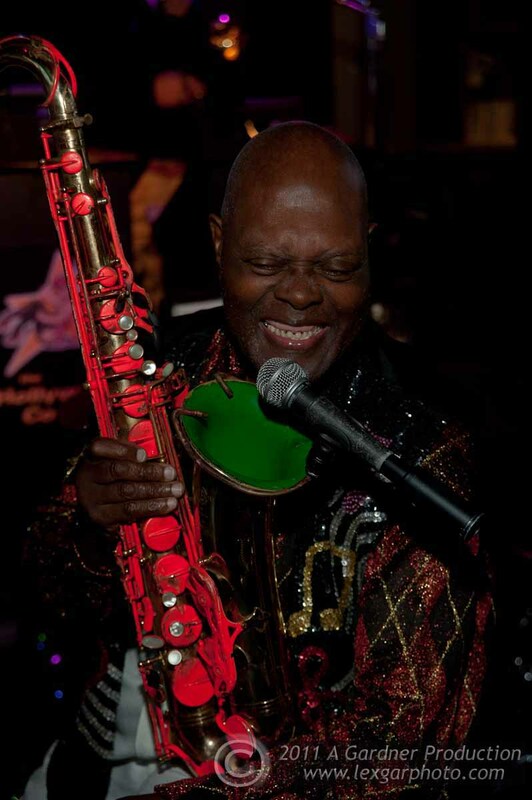 Perhaps no one is more aware of this than an 84 year old from my hometown by the name of Big Jay McNeely. He is one of the great honkers that Fred Kaplan so eloquently writes about in his piece, in this month’s BLUES JUNCTION entitled Surreptitious Treasure. At the conclusion of that article you can find recommended reading including a book entitled Nervous Man Nervous: Big Jay McNeely the Rise of the Honkers and Shouters. Big Jay from L.A. is a tenor sax legend and a guy who understands that many of the entertaining elements that came to be associated with rock & roll had their nexus in a thousand smoke filled nightclubs in front of sweat soaked dancers and throngs of adoring fans in the 30’s, 40’s and 50’s. 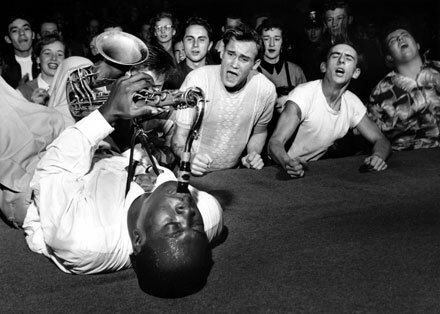 I have often contended if Elvis Presley or John Lennon had a saxophone in their bands then Big Jay McNeely would be one of the biggest icons in American music. Instead he has to settle for mere “legendary” status. 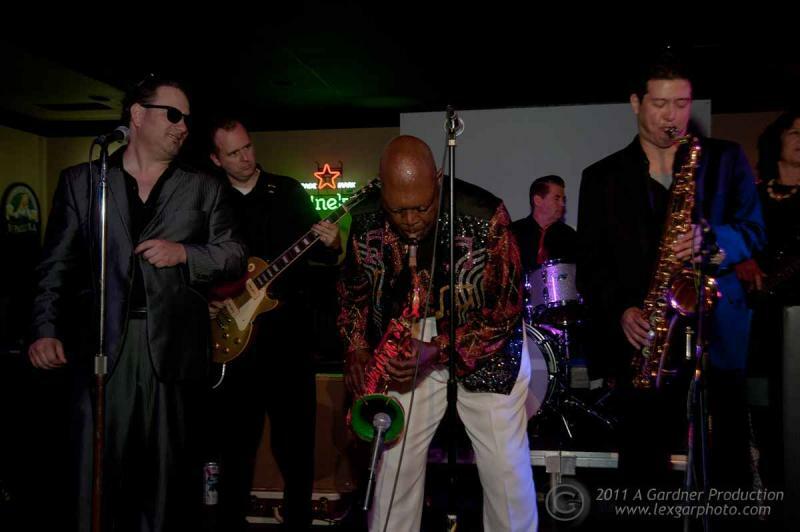 I caught up with Big Jay McNeely at a former Moose Lodge in Fullerton, CA, that is now a live music venue called Big's Grill. That is where the Hollywood Combo opened up for and backed the 84 year old legend. In the nightclub’s V.I.P. 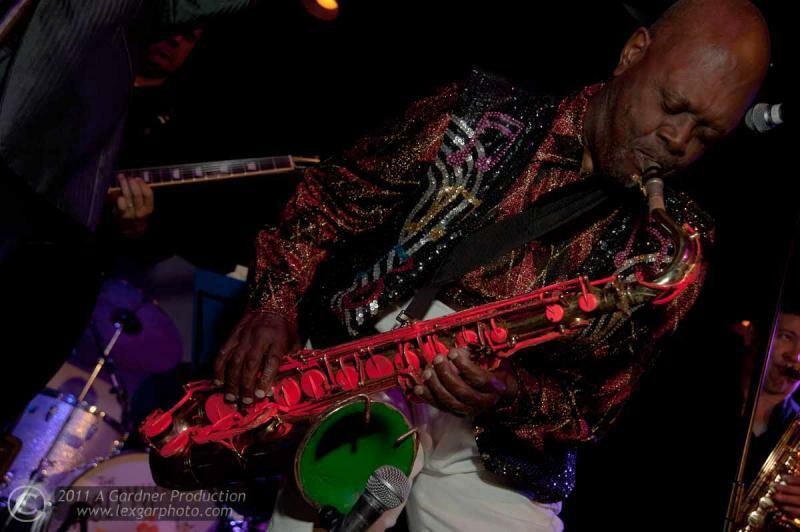 room before the show, I sat down with Big Jay McNeely and we talked about his career, his life, his faith, his honking tenor sax and a little blues history. David Mac (DM): You are looking great. How you doing? 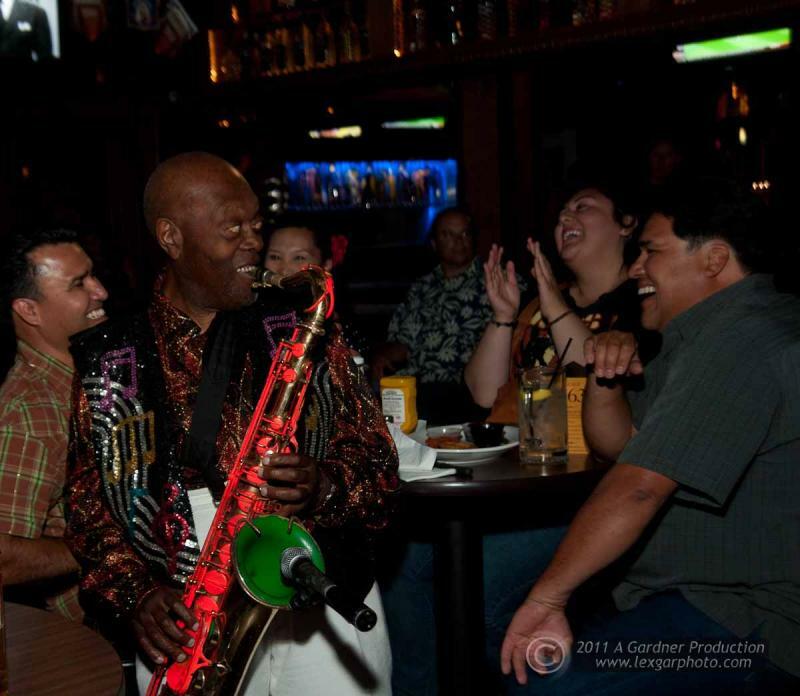 Jay McNeely (JMc): I feel great. I’ve lost some weight. I got down below 200 pounds and it feels good. 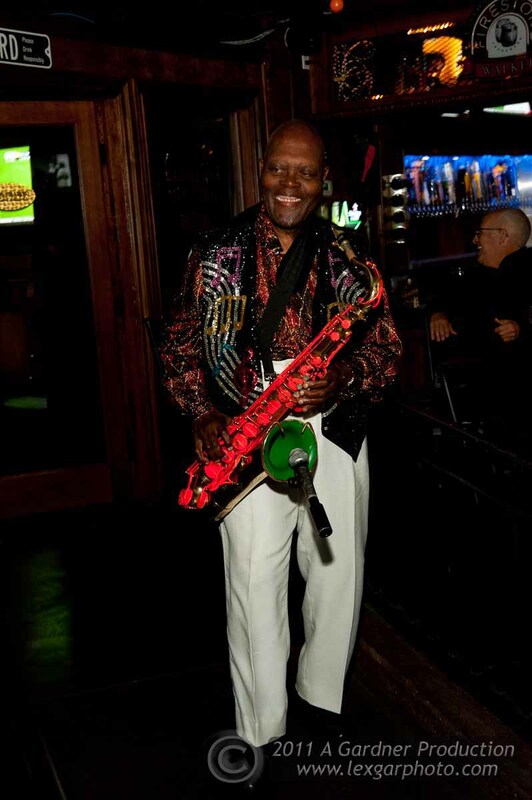 DM: So now do they introduce you as Medium Jay McNeely? JMc: (laughs) No, no…I’ll always be known as Big Jay. DM: Let’s take it from the top. What got you started in this crazy business of making music? JMc: I got a job over at the Firestone plant when I was 16 years old. Those last four hours will kill you man. You know you show up to work and the first four hours go by pretty easy but the last four…ouch. I knew there had to be a better way to make a living. DM: You had already been around music by that time though, even at that young age. JMc: Oh yea, my older brother Bob played saxophone. I wanted to play drums or trombone. My family couldn’t afford it though. Then when my cousin got killed I got his alto sax. I took lessons from a woman named Miss Hightower. She charged 25 cents a lesson and it cost another 10 cents to get there on the bus. Later on I studied with my friends Sonny Chris and Hampton Hawes when I transferred from Jordan (high school) to Poly (Los Angeles Polytechnic High School). 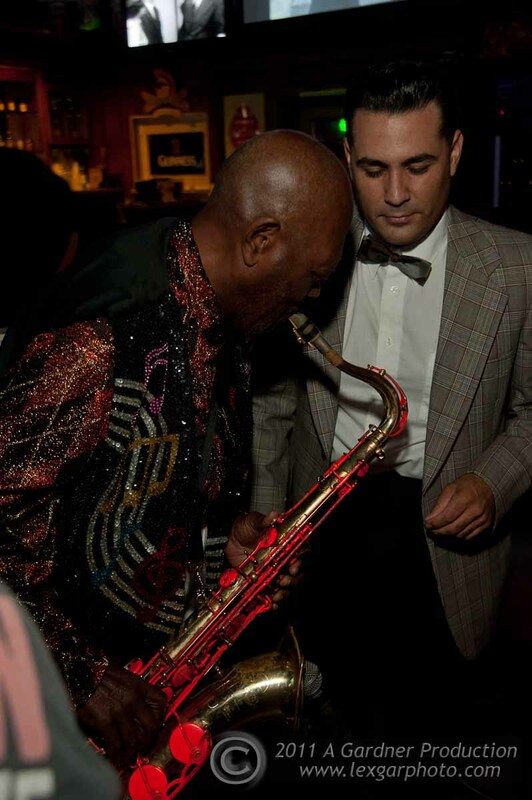 Sonny went deeper into the jazz thing and I was more interested in rhythm and blues. But the jazz studies allowed me to play anything. I received lots of training and lessons back in the day. Hawes became first chair at RKO which helped to get me work at the studio. By then I was playing mostly tenor. I picked up my brother's tenor when he went off to the army. I really liked the sound. DM: Even though you had lots of formal, classical training, you always did your own thing. You always had your own sound. JMc: That’s right. I don’t play a number just to fill a spot. Everything I play has to have a purpose. I watch the audience to see how they respond. My whole thing is to get the audience involved. Once you do that you got 'em. I mean some guys never get past the tedium of jazz training. By starting off playing jazz, I’ve been able to play with more depth. When you study jazz you have to be careful you don’t lose your soul. You have to develop your own natural ear. I just had to do my thing. DM: How did you hook up with Johnny Otis? JMc: I got up and played on an open mic night at his club in L.A. called the Barrelhouse. He liked what I was doing up there. So I joined his house band. That was 1948. By 1949 I had a 6 piece band: bass, drums, guitar, piano, myself on tenor and my brother on baritone. JMc: Oh yea. We played everywhere. I’ve worked with so many people in so many places. I’ve played with everybody from Lionel Hampton to James Brown. I played with Bud Powell, Dizzy, Errol Garner, Little Richard, the Five Keys, the Ink Spots and Big Joe Turner. I played Birdland, the Celebrity Club and the Apollo Theater in New York City. DM: How did some of your signature stage moves come about? JMc: When I was playing at a little club in Clarksville, TN, I had a female singer from Detroit and a pianist by the name of Carl Perkins. My brother was also on the gig. I was in the middle of a solo and I just went down on my knees and the whole audience started screaming. I left it in the act. (Laughs) I started laying down on stage, all kinds of crazy stuff. One time I was playing at Wrigley Field over on Avalon in South Central (Los Angeles) with Lionel Hampton. We were set up right where second base would be I ran up past the pitcher’s mound and slid all the way to home plate on my knees. I didn’t miss a note by the way. DM: OK… now you've got to tell me about painting your horn. JMc: I got the idea when I saw a burlesque dancer come out in fluorescent paint. DM: (Now I’m laughing) Fluorescent paint? JMc: Oh yea…I’m not kidding. I used to carry a black light and use this almost invisible paint that would only show when the light was on it. Now I have this red paint on the horn. DM: You will have to excuse me as this is before my time but I have read about how you used to whip a crowd into a frenzy. JMc: Oh yea, I was barred from playing in Los Angeles because they didn’t like the way white kids were responding to my music. They would go crazy. I had to get a special permit to play with Earl Bosley. One time I was opening for Nat King Cole, I got the audience so excited Nat couldn’t sing, he had to just play piano. DM: Shows back in those days often included multiple acts. You were a part of that whole scene. JMc: There were so many different musical situations. It depended on which booking agency represented which artists. Then which agency had relationships with which rooms. For several years I would go out on what they called the top 10 tour. DM: How did that work? JMc: They would take 10 artists who had Top 10 hits on the rhythm and blues charts and we would tour all over the country. In the south we would have to do two shows in two nights. The first night we would do a show for a white audience and we would play the next night for a black audience. DM: Are there any songs you feel you have to play or an audience expects to hear? JMc: There are a few actually. I play whatever I want but I think 'Something on Your Mind' is one audiences expect. It has been done by so many other people too. But I think they want to hear it from me. DM: Lets talk about that tune. JMc: I bought 'Something on Your Mind' and three other songs for $25 from a guy named Rocky. He arranged it kind of like a Fats Domino tune. I recorded it in Seattle, WA. My future wife heard it on the radio. She called me to find out where I got the song. I told her I bought it for $25. We ended up getting married. DM: Would you like our readers to know who you married? JMc: Sure….My wife was a great singer by the name of Jackie Day. She had some hits on the rhythm and blues charts that were recorded here in Los Angeles. I put her together with Maxwell Davis over at Modern Records. DM: Do you have any songs in your catalogue that you are particularly fond of? JMc: I love 3-D. It is really hard for a lot of musicians to play. DM: Are you going to do it tonight? JM: I might give it a shot. DM: I think these cats can handle it. JMc: Oh yea…they are real good. Ron (Dziubla) is a monster on tenor. I really like Tommy’s (Harkenrider) guitar playing a lot. I got this jam in the valley on Monday night. I would love it if Tommy would come with me. I am more comfortable when I am with guys who I know, know my stuff. 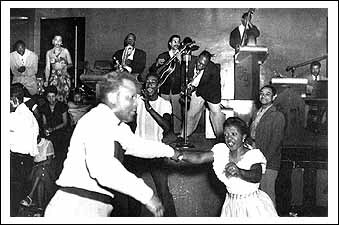 DM: What is the biggest difference you see out there on the blues scene today as compared to the late 40’s and early fifties? JMc: It is harder and harder to find musicians who can play my music anymore. When you say “blues” the first thing they do is put you in a category, like Jimmy Reed or something. If they can play a Jimmy Reed tune they think they can play the blues. I asked them what kind of blues do you play? They say classic blues. JMc: (laughs) You tell me Dave. You don’t have too many guys out there these days like Maxwell Davis, who understood what I’m about. I loved making records with him in L.A. We cut a bunch of sides for Modern Records. I mean this guy was a songwriter, producer, arranger and a sax player so he understood me. You talk to some people who think they know blues but have never even heard of Maxwell Davis. A lot of guys just don’t get it at all. I was playing a festival in San Jose a few years ago. This sound guy back stage kept staring at me while I was playing. When I got through he asked me what type of mouthpice I was using. I said to him, It ain’t the mouthpiece man. DM: Let’s face it the music business has changed a lot through the years. Even blues music goes through changes. What do you think is the one thing that has contributed to your longevity and success besides your musical education and training, which we talked about? JMc: Jehovah….Listen, faith is hope. You got to have hope. That’s why I never got involved with drugs. Dope destroyed a lot of musicians. There are some guys who thought you had to do drugs to play, to feel, to live. 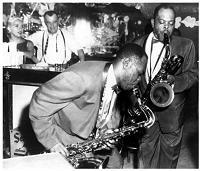 They thought if they took drugs they could play like Charlie Parker. When I think about it, I’ve had so many close calls on the road. I should have been dead. I couldn’t have gotten through what I went through at an early age if I didn’t have hope. The hope of living forever sustained me. That’s what keeps me alive. JMc: You are going to hang out for a while…Check out the show. DM: Are you kidding. I wouldn’t miss it.